The Data Diver is a new type of vehicle: a hand launched gps enabled boat that doubles as a motorized profiling system. With only two moving parts, the vehicles travel at up to 4 knots, reversing motor direction to dive vertically up to 100 meters. Apium developed these vehicles to study swarm control algorithms to perfect the simple and intuitive control of groups. With this swarming ability and the company’s rugged “drive and dive” vehicle architecture, new types of distributed data collection are possible. Apium is currently developing a product based upon this technology, with standard versions integrating commercial sensors to potentially include depth, temperature, conductivity, sound velocity and dissolved oxygen, as well as fluorometers, hydrophones and sonars. The prototype vehicles last 1-2 hours on a typical deployment, and measure temperature and depth. Their low profile and high speed let them station keep in surf-zone environments. 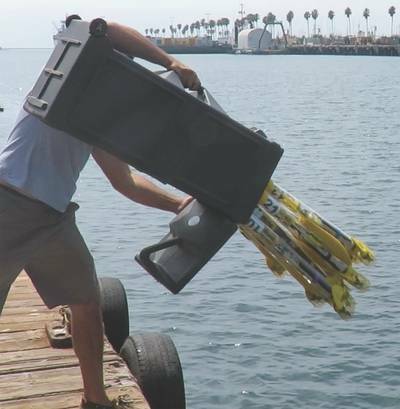 The version currently in development is targeting an operational endurance in the range of 8-12 hours, with top speeds of 6-8 knots and a maximum depth rating of 250 meters – all in a package that weighs less than 10 lbs and is easy to ship or carry-on when traveling. Apium transports the current prototype in boxes of 10 units, which double as launching containers for rapid deployment. The unique size and low cost of the vehicle is made possible by the motor technology developed and supplied by Blue Robotics. Additionally, the vehicles use a wireless inductive charging system provided by WiBotic that lets them charge at a rate of 50 watts. 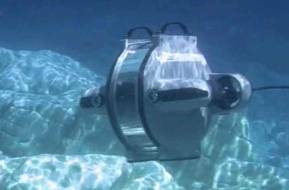 The advent of such inexpensive and capable technologies is fostering a revolution in low cost marine systems. As the company continues to refine its prototype for commercial usage, Apium said it is open to considering application ideas and associated requirements. Partnering for system use-case demonstrations is also possible. Additionally, Apium’s work on swarm control is available for licensing on third party vehicle platforms, enabling unique applications with on-the-fly behavioral planning at sea and in the air.